LSBU Academy of Sport graduate Stephen Hyland achieved his first world record in 2005 by completing 512 repetitions of chin ups in one hour — at the age of 52. Almost ten years later, Stephen's strength continues to grow as he demonstrated in 2013, his most recent record achievement when he beat his own record for the number of chin ups in an hour to 1019 – almost double. He now holds eight world records and 25 Guinness World Records for chin-ups and pull-ups plus over 80 world records in total. For some, turning sixty might be an indication of slowing down. Stephen, however, continues to exceed expectations and overcome new obstacles, the most recent being set at LSBU's very own Academy of Sport. 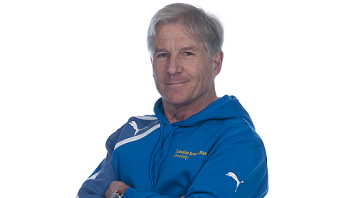 Having just completed LSBU's CYQ Certificate in Fitness Instructing, Stephen is fitter than ever. The qualification is aimed at individuals wanting to pursue a career in the health and fitness industry in the context of gym-based exercise. His favourite part of the intense course was Academy of Sport instructor and Fitness Trainer UK director Leon Marshall, known for his renowned teaching style. Stephen believes the secret to his success is to train like it is always a competition. His rigorous workout routine consists of training six days a week, including twice a day for three days, leaving just a day's rest a week. "Gaining the CYQ Certificate in Fitness Instructing allows me to train aspiring athletes," explains Stephen. "I work alongside George Burton and have also been doing Parkour (a physical training technique) since I started the course and the training principles are very transferrable. My training techniques are significantly different to the ones the course entails but I've learned what is needed to work in a gym." Although he is now retired, Stephen has no intentions to slow down and is instead planning on challenging another world record this year as well as using his newly acquired certificate to train upcoming fitness enthusiasts.